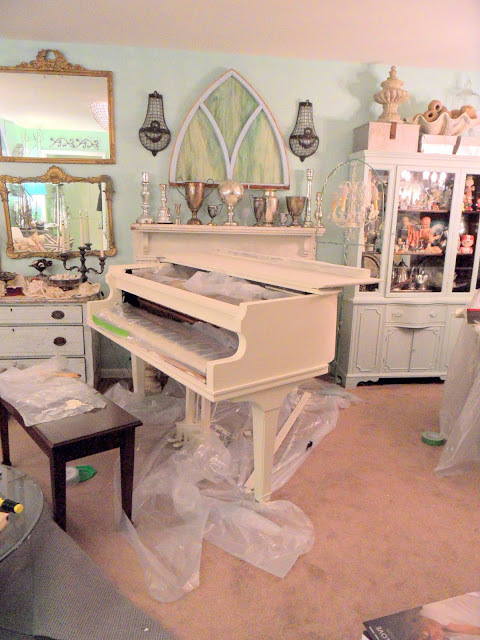 I painted my grand piano today, well at least started to; that is before I ran out of Annie Sloan Chalk Paint in Old White! Hopefully I will make the hour long journey to the nearest stockist in my area and get some more tomorrow and get it finished! Thrill of the Hunt is my closest Annie Sloan Stockist. 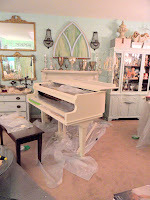 Their shop in Ashland, VA is a wonderful place to visit! Hopefully I will get some more photos of the finished project posted very soon! Don't forget me and the other Petersburg Pickers are having another one of our FABULOUS Estate Tag Sales Thursday, July 11 - Sunday, July 14 in our nearly 10,000 square foot Warehouse in Petersburg, VA! www.PetersburgPickers.com for more info!